As Death plays with his marionettes of the other three Horsemen, Null gloats in the faces of the Turtles and the Mutanimals, who are bound to stakes by mechanical latches and guarded by War, Famine and Pestilence. Null explains that he wants vengeance for his earlier defeat at their hands, which cost him the chance to extend his life-destroying operation off of Earth. He plans to force Kid Terra to execute them all and enters the skull temple to fetch his prisoner. Inside, however, he finds his three other prisoners, Kid Terra, Juntarra and Azrael, have all escaped. In her eagle form, Azrael attacks War, annoying him. Enraged, War lashes out and accidentally smashes the stakes and bonds holding Raphael, Donatello, Jagwar, Mondo Gecko and Screwloose. Don quickly moves to the controls to figure out how to free the rest of his friends while Raph and the others keep the Horsemen busy. With a little rewiring, Don sets the other Turtles and Mutanimals loose and a big brawl erupts. Elsewhere, Kid Terra and Juntarra spot Death controlling his Horsemen marionettes from a hilltop. Kid leaves to take Death on while Juntarra rushes to her son’s (Jagwar’s) side in combat. Climbing the hill, Kid slugs Death in the jaw, but the Horseman has bad news for him: he’s about to die. Null takes aim with his handgun and shoots Kid through the chest. Azrael swoops down and steals Null’s gun as Death lords over the dying Kid Terra, hungry for his soul. The battle with the other three Horsemen is not going well, as they cannot be hurt. Screwloose notices that, in his distraction with Kid, Death has dropped his marionettes. Screwloose smashes the toys, causing the Horsemen to vanish. The distraction is all Null needed to regain his gun from Azrael, allowing him to gain the space he requires to spread his massive bat wings! Null reveals that with each new act of evil he grows ever stronger and, promising they will meet again, takes flight. The Turtles and the Mutanimals gather around Kid Terra, who is still in the grip of Death’s boney fingers and barely clinging to life. Inside his mind, Kid sees a bright light at the end of a hallway and heads toward it. As soon as he enters the light, Death gleefully plucks his soul from his body. 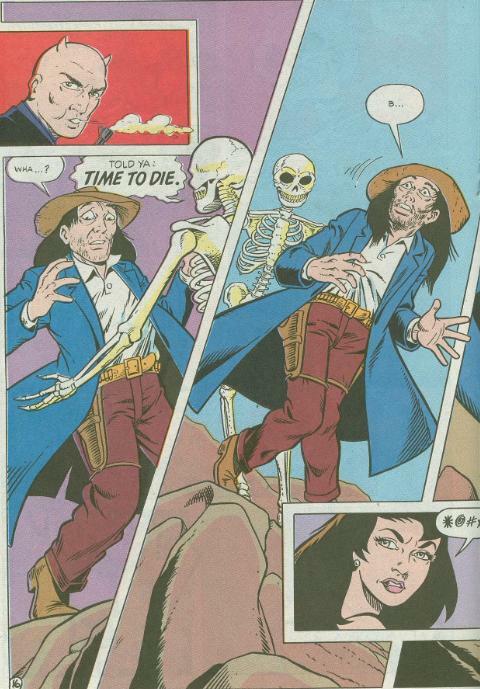 Juntarra won’t let him have it, though, and smashes Death with his own scythe. Azrael catches Kid’s soul and returns it to his body. Kid comes to and Raph (Raph?) prepares to remove the bullet from his chest. Meanwhile, Jagwar and Juntarra are finally reunited. As the heroes celebrate their victory, none notice Death reassembling and escaping on his horse. Epilogue: With the help of herbal remedies from Juntarra, Kid is on his way to a recovery. Leonardo tells Splinter that he’s growing very homesick. Raph informs him that they won’t be getting a ride back to New York from Cudley, as according to Azrael, he returned to Dimension X in response to an emergency call from Stump. *This story is continued from Mighty Mutanimals #6. The story continues in TMNT Adventures #40. *Raph and the Mutanimals thwarted Null’s attempt to expand his operations to outer space in Mighty Mutanimals (miniseries) #3. *Death is shown escaping on a black horse. Biblically, Death rode the pale horse while it was Famine who rode the black horse. 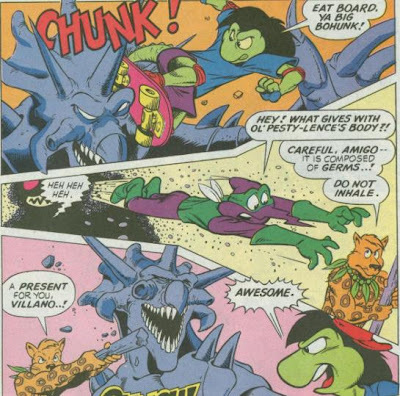 *Cudley was recalled to Stump Arena for an emergency in TMNT Adventures #38. *Null will return in TMNT Adventures #55. *This issue was published in the UK by Fleetway as TMHT Adventures #75. And so “United we Stand…” comes to a conclusion, ending what’s basically been an eight-issue story arc for the Mighty Mutanimals. The finale may disappoint due to the speed and convenient ease in which the Horsemen are defeated, but this issue triumphs through sheer force of drama. Null is, without a doubt, the best original villain to come out of TMNT Adventures. He’s evil for the sake of being evil, sure, but his demonic origins provide sound reasoning for such seemingly shallow motivations. But what’s best about Null is that he shows how evil he is on both a large scale (selling the world out to conquering alien warlords) and a small scale (socking girls in the face over and over and over again). In a way, he’s a better villain than the Shredder, whose history in this title is burdoned with his early “silly” depictions. Null, meanwhile, has masterminded two story arcs in the series, each of which have been the result of slow build-up. His machinations are ingenious; this is a villain who’d never waste time trying to trap his foes in a maze at an abandoned mousetrap factory. And even when he’s doing the typical cartoon villain shtick, like inexplicably letting the heroes survive while he escapes, screaming vengeance, there’s a cruel method to his actions even when in retreat. “I’m not going to kill you. I don’t kill women, I use them”. He’s just a great, great bad guy. Now, the obvious problem with the Turtles fighting four enemies of Biblical stature that can control and distort reality to their pleasure is that… well, the odds are squarely stacked against them. And so, the “marionette” dues ex machina is used as a means to escape an otherwise unbeatable dilemma. I can cut them some slack, as they were introduced in the previous issue and thus don’t come completely out of the blue, and I dig that Screwloose of all characters was the one to save the day, but they do reek of being something of a cop-out. But even when the Horsemen are defeated and Null’s plan is thwarted, the drama still persists as Kid Terra faces death (literally). Terra still had a lot to answer for considering he killed an innocent bystander early in the series, but I think giving his life to save his friends and the Earth is close-enough to calling it square. The panel doesn’t dwell on it, but you’ll notice that it’s Man Ray who is holding vigil over him as he recovers from his bullet wound. Sadly, the entire driving force of this arc (Jagwar striving to be reunited with Juntarra) is relegated to a background image in one panel. But there was so much going on in this issue that something had to get the axe and I’m at least grateful they acknowledged their reunion in some capacity. Allan’s art rocks out-loud and I love seeing him try his hand drawing all the Mutanimals. The Four Horsemen (who were designed by Peter Laird) look stupendously menacing, War in particular, who has the luck of being the most recognizable of the Horseman thanks to his inexplicable selection as a playable character in Konami’s TMNT Tournament Fighters game. Barry Grossman drops the ball in a few places with this issue, mixing Don and Raph up twice. Raph orders Don to free the others while he takes on the Horsemen, then the next panel shows Don charging toward the Horsemen instead of Raph. 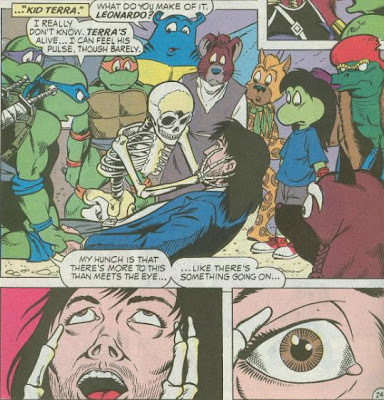 At the end of the issue, Raph says he can surgically remove the bullet from Kid’s chest and, I dunno, I got the feeling that was meant to be Don. And c'mon, how can you forget that Death rides a pale horse? Gary Fields also makes some unfortunate lettering errors on page 22, as Wingnut boasts Dreadmon’s dialogue (complete with “mon”) and Dreadmon steals a “yut!” from Leatherhead. I feel kind of guilty, because I never mention the colorist or the letterer in my reviews until they make a mistake, which isn’t really fair. They both typically turn in excellent work on this title, so I just want to point out that mistakes like these are far from the norm. As Null’s second big story arc, I felt “United we Stand…” held up better than the first. It tends to get overshadowed in memory by “The Future Shark Trilogy”, which is only a couple issues away, but it still deserves credit for its darker tone, awesome villains and actually entertaining implementation of political and environmental issues. You gotta respect Null for NOT being a furry. Also, I'm glad I wasn't the only one who thought it was odd that "Raph" supposedly knew how to surgically remove a bullet. But... that's what made him awesome in Archie-verse! These reviews are fun to read! Keep them coming! The good issues are almost here! Where did you even get all of these? Did you just have them in the first place? I used to read every stinking issue of anything that came from the Archie universe and loved every issue, but have forgotten about so much of this stuff. Don't feel overwhelmed, EVER, and quit this, friend. This is such a blast of nostalgia that I don't even know how to comprehend it, fully. 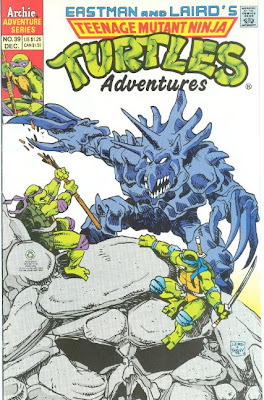 This particular chapter was the first TMNT comicbook that i remember reading, so nostalgic! I don't have the comic anymore and this is pure gold to read and see these pictures again after so many years, thank you!